One of the hardest parts of a relationship can be trusting your partner, especially if you've been hurt in the past. While most couples do this by being open with each other, one woman came up with a much stricter approach. 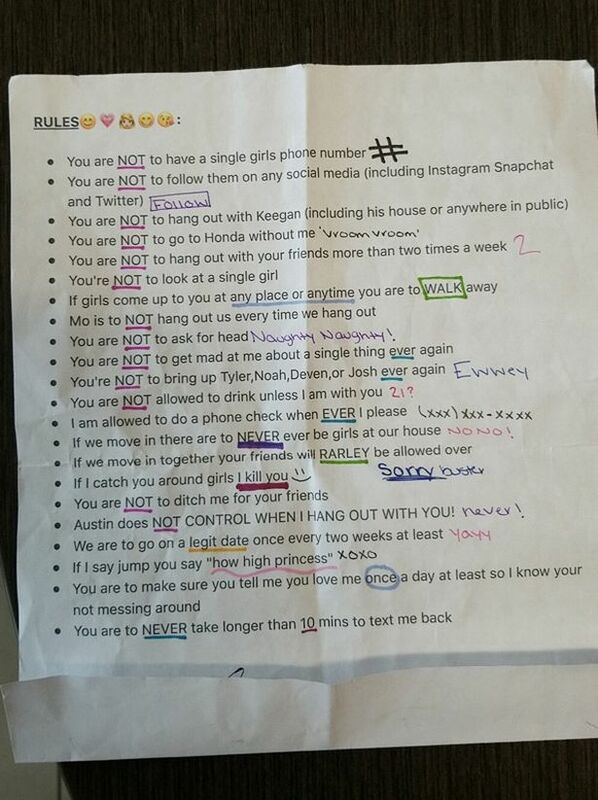 She wrote a list of 22 things her boyfriend was banned from doing - and made him sign it. The list has been shared on social media, and people are horrified by the demands - which includes not drinking unless she is present and always replying to her texts within ten minutes. Just curious when this guy had his balls cut off? MGTOW is the solution. Stop cucking. Well, pretty much every girl's objectives but never seen it put in writing.